West One has won an award in the European Property Awards 2016-17 (Residential High Rise Development category). 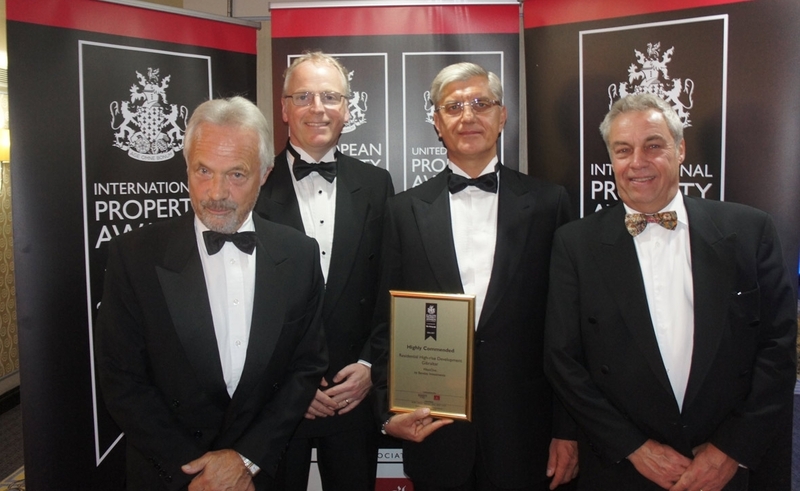 The international panel of judges, all property experts, is chaired by Lord Best. The developer, West One (Gibraltar) Limited, together with their development consultant and sales agency Chestertons Gibraltar, and local marketing agency Copywrite, were at the Marriott Hotel in Grosvenor Square, London on Thursday night to collect the award at a prestigious event in front of hundreds of European property professionals. Dominque Searle, Gibraltar’s representative in the UK, was a guest of the developer. Evgeny Cherepakhov, chairman and owner of the developer was clearly delighted. “We put considerable effort into designing a development which Gibraltar needed and suited the local area. We were taken aback on launch by the sheer speed of sales which demonstrated just how successful our design team had been. The hard work didn’t end there. The award submission was a 40 page dossier covering every aspect of the design, marketing, selling and construction of West One. This is a proud moment for me. The hard work does not stop with West One though. We are now working even harder on Eurocity, the adjacent development. Hopefully we can bring a further accolade to Gibraltar.